One of Blakes components to his "Blueberry Cheesecake" dessert was very interesting to me and I thought deserved its own post. 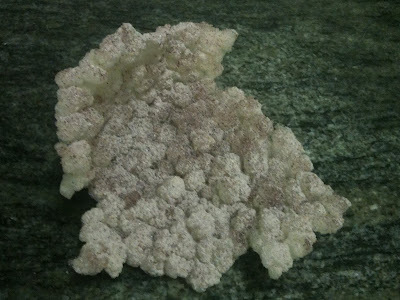 The component was fried tapioca pearls which he used to add both texture and a unique flavor. The technique he used to create these little fried morsels was really cool. He basically cooked large tapioca pearls in water until they were fully cooked. He then took the pearls which still had some of the slimmy residue on them and spread them onto a dehydrator tray and dehydrated them overnight. (the picture above is the tapioca pearls that have been dehydrated) Blake then proceeded to break the sheet into smaller shards and fried them in grapeseed oil. The shards puffed up a lot as soon as he placed them in the frying oil. 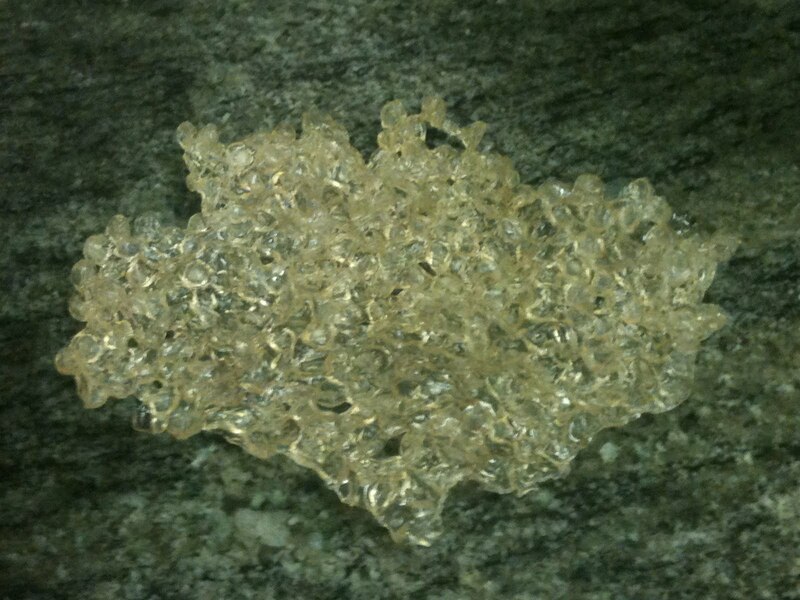 The pearl shards took less than a minute to fry in the oil. He took the pearls out and immdiately "seasoned" them with a mixture of freeze dried blueberry, buttermilk powder, and fennel pollen. I tasted the pearls before and after the seasoning. The pearls that were not seasoned had a very neutral flavor and a very crisp and crunchy texture. I really enjoyed learning a new technique for frying tapioca. I think the possibilities for flavoring the finished fried tapioca are endless. You might even try flavoring the cooking liquid that you cook the tapioca in before dehydration and frying. The picture below is a finished shard of fried tapioca after being seasoned. Thank you Blake for making a really awesome component and teaching me a new technique! You can flavor the cooking liquid, but choose your flavorings carefully. Sugar will inhibit the puffing, as well as increasing the chances of it burning when frying. And any fat or oil present will also inhibit the puffing. But as long as you avoid fats and sugars, you can definitely flavor the water. Remember, also, that the cooking liquid will have to be very intensely flavored for that flavor to come through later after puffing. Hey thanks David. I will def. Keep that in mind when I am adding flavor. Was wondering if you could send me one, and if you can dehydrate in the oven instead? I never really used a recipe for the tapioca. I always just cooked them in water until they were fully cooked (no white). As for the dehydration of the cooked pearls, I would imagine that you could use an oven set on low and maybe even with the door open so that the convection would not continue to cook the pearls, but instead draw out the moisture. Hope this helps. Let me know how it comes out. Drying the pearls with squid ink folded through creates a dynamic looking cracker once fried. Just make sure you dehydrate above 65c to avoid making your diners sick.